Cybercriminals in developing nations are being targeted in a new effort to combat the illegal activity. The International Cyber Security Protection Alliance has launched a research project to identify how attacks are likely to evolve over the next eight years. 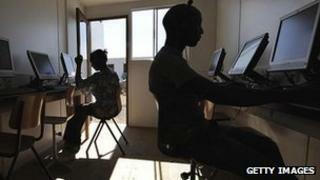 It said that faster links to the net in parts of Africa, Asia and Eastern Europe were likely to create problems. The ICSPA will advise governments and local authorities on how best to react. The organisation is a coalition of law agencies, security companies and businesses, including Visa Europe and the defence firm EADS. "It's not just about putting a black mark against a particular nation because many of these countries are the unwilling hosts to cybercriminal networks," John Lyons, the organisation's chief executive, told the BBC. "We know the countries that provide 'organised cybercrime' with the ability and the hosting capability to attack the West in terms of its business and customers. "So, what the ICSPA is looking to do is to work with those nations to provide support to help them improve the cyber-resilience of their national infrastructure, to aid their own economies, and to help their law enforcement groups tackle cybercriminals who work out of their country." Although the research project has only just got underway, the group has already started to co-ordinate action. Members of the UK's Serious Organised Crime Agency (Soca) began work with the Ghanaian government in February to help it take technical steps to prevent cybercrime, and ensure offenders are prosecuted. Mr Lyons said Nigeria, Botswana, Uganda and Rwanda were among nations likely to be targeted by the campaign. The countries were starting to benefit from improved internet access, but would struggle to "suppress the criminality that will come with that connectivity," he said. Other countries on his group's watch list included Bulgaria, Romania, India, the Philippines and parts of Latin America. The ICSPA wants companies based in developing nations to contribute to the costs of its efforts. However, Mr Lyons acknowledged that the richer nations also needed to do more to combat internet crime. "Something like 67% of malware which is used to attack Western businesses is hosted in the US on servers," he said. "The US needs to take steps to tackle that particular issue." The ICSPA plans to issue a report covering its initial findings before the end of October.